Information to help those organising events control or reduce exposure to noise. Find comprehensive information on your duties in noise at work. Over one million employees in Britain are exposed to levels of noise that put their hearing at risk. Noise is measured in decibels (dB). An 'A-weighting' sometimes written as 'dB(A)', is used to measure average noise levels, and a 'C-weighting' or 'dB(C)', to measure peak, impact or explosive noises. Unlike workers, there is no specific legislation setting noise limits for the audience exposure to noise. However, HSE strongly recommends that the A-weighted equivalent continuous sound level over the duration of the event (Event LAeq) in any part of the audience area should not exceed 107 dB, and the C-weighted peak sound pressure level should not exceed 140 dB. The above sound-level exposure values are for the whole of the audience area. For practical purposes, it is usual for audience sound-level exposure to be monitored close to the front of house sound mixing position. For the largest outdoor and indoor venues, this can be up to 75m from the front-of-stage barrier position where the audience sound-level exposure can be significantly higher than at the front-of-house sound mixing position. Make sure that during the sound check the difference in sound level between the front-of-house sound mixing position and the front-of-stage barrier – and, where delay / distribution stacks are in use, at the barrier for each delay / distribution stack – is established. This will then allow a guideline sound pressure level for the front-of-house sound mixing position to be determined that will restrict the whole of the audience sound-level exposure to below an Event LAeq of 107 dB, and C-weighted peak sound pressure levels to below 140 dB. Where practical, the audience should not be allowed within 3m of any loudspeaker. This can be achieved by the use of approved safety barriers and dedicated stewards, wearing appropriate hearing protection. Where this is not practical, the overall music sound levels will have to be modified so that people closer than 3m to the loudspeakers are not exposed to an Event LAeq of more than 107 dB or C-weighted peak sound pressure levels of more than 140 dB. Under no circumstances should the audience and loudspeaker separation distance be less than 1m. Where the Event LAeq is likely to exceed 96 dB, advise the audience of the risk to their hearing in advance, eg either on tickets, advertising or notices at entry points. Sources of noise other than music also need to be properly controlled. In particular, the noise from pyrotechnics should be restricted so that at head height in the audience area, noise from pyrotechnics does not exceed a C-weighted peak sound pressure level of 140 dB. Discuss this requirement with the specialist pyrotechnic technicians before the event, as charge density and altitude of deployment may need adjusting to meet this requirement. Noise nuisance – usually dealt with by a local authority's environmental health or services department. 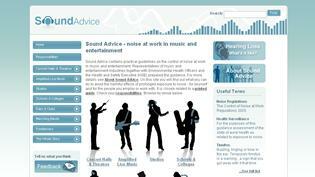 Sound Advice contains practical guidelines on the control of noise at work in music and entertainment.